Learn about the best thermal imaging camera for business surveillance, along with pricing, and frequently asked questions about infrared cameras. A thermal imaging camera, or thermal imager, is a type of camera that uses special photoconductors to capture pictures that cannot be taken by a regular camera or seen with the naked eye. Also known as an infrared camera, a thermal camera detects temperature by capturing the infrared light emitted by an object, human, or animal to form a thermal image. There are two types of thermal imaging cameras - cool infrared cameras and uncooled thermal cameras. Infrared cameras are used in a wide range of commercial and industrial industries for various purposes, such as inspecting electrical panels or detecting furnace problems. Thermal imaging is also used for home or building inspection due to its accuracy and ability to function in all weather conditions. Below, we take a look at the top 17 thermal imaging cameras and answer some frequently asked questions about thermal imaging. What is the price range of thermal imaging cameras? Low-end thermal image cameras range between $399.00 and $799.00, while the high-end versions typically cost between $1,500 and $3,000 or more. What is the basic function of an infrared camera? A thermal camera detects and measures the infrared heat emitted by an object or person, known as a heat signature. The camera then converts that data into a digital image which is displayed on a video monitor or LCD screen. What features do I need in a thermal imaging camera? Buy an IR camera with the highest detector resolution you can afford. Make sure it supports multiple image & video formats. 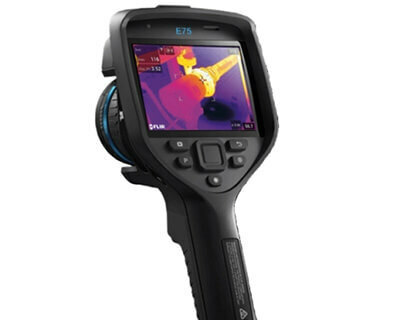 A thermal imager should meet or exceed 2% or 3.6°F. Select a camera that is compatible with WiFi so that you can import images to your mobile device. Good software to allow you to create custom reports. Allows you to edit and manipulate images. Allows you to stream video over WiFi or via USB. Ongoing technical support and training. Is thermal imaging the same as night vision? No. Thermal imagers are sensors that detect heat, while regular cameras make images from visible light energy. A thermal camera can detect the slightest change in an object's heat signature and is especially useful at night when there is very little light to bounce off an object. Are budget thermal imaging cameras good enough to use? This depends on what you need to use the IR camera for. If you intend on using the IR camera for building inspection or surveillance, there is a variety of budget thermal imaging cameras available that are more than capable of meeting your needs. However, if you work in a profession that uses IR cameras, you may need to purchase a more expensive thermal camera with greater functionality. What is MSX Image Enhancement? 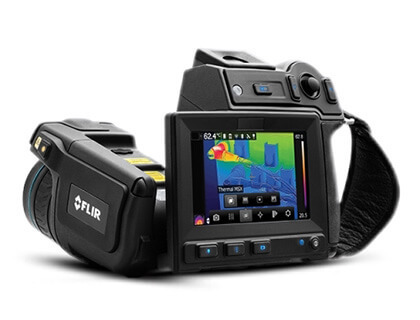 This pocket-sized thermal imaging camera features Flir's unique Multi-Spectral Dynamic Imaging (MSX). MSX adds key details from the onboard visible light camera to the entire infrared image in real-time. The result is an all-in-one, undiluted thermal image with visible light features that allows you to instantly see results in the camera's LCD. REED Instruments, R2050 80 x 80 px Resolution Thermal Imaging Camera. Mastercool 52325 Thermal Imaging Camera Complete Kit. 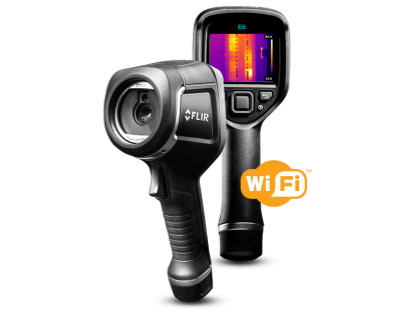 Flir E6 Thermal Imaging Infrared Camera w/ Wi-Fi. REED Instruments, R2100 160 x 120 px Resolution Thermal Imaging Camera. How far can a thermal imaging camera "see" in the dark? An IR camera measures infrared light according to detection, recognition, and identification based on an object's pixel counts. The camera range depends on the size of the camera lens and its resolution. The higher the resolution, the more clearly you can "see" and identify an object. For example, a hand-held IR camera with a detector resolution of 160 x 120 pixels can detect an object up to 200 feet away, but not necessarily identify it. No, a thermal imaging camera can only detect heat that radiates off an object, human, or animal. As walls are thick and usually insulated, the camera is unable to detect heat on the other side of a wall. Flir TG167 74701-0104 Spot Thermal Camera with Image Storage. 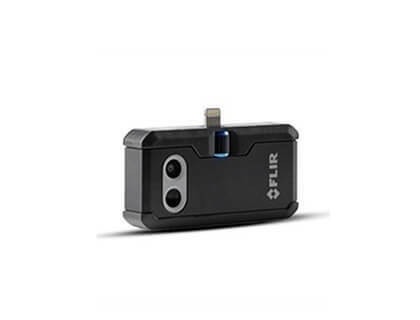 Flir ONE PRO-MICRO-USB 435-0011-03 Thermal Imaging Camera. Flir TG167-NIST Thermal Camera, 9Hz with NIST.